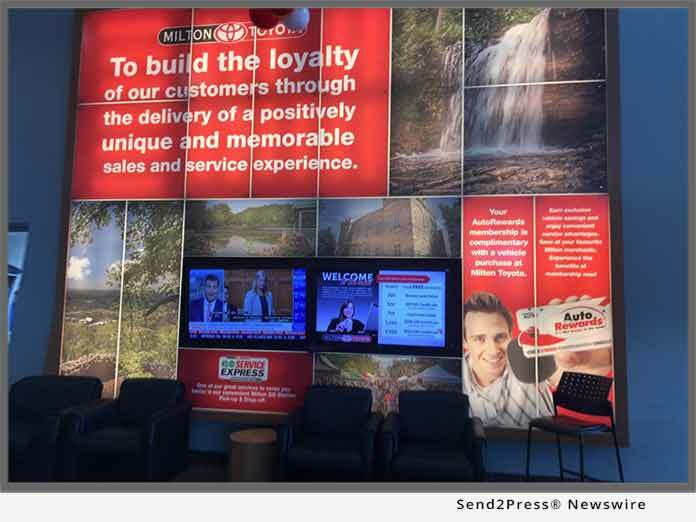 ODESSA, Del., Nov 05, 2018 (SEND2PRESS NEWSWIRE) -- In today's market, an automotive dealership loyalty rewards program can be a very robust tool that drives all areas of a dealer's business, says AutoAwards. When you leverage its power through your marketing touchpoints, it can drastically multiply the value of the program, and your dealership. Let's review the proof of that success. At Milton Toyota, their loyalty rewards program has been an important part of the store's operation since 2008. "Through the integration of our territory exclusive rewards program, we've noticed a year over year increase in customer engagement, as well as service and sales," says Chris Gorman, president at Milton Toyota. "Our rewards program is the cornerstone of all we do and stand for at our dealership. It gives us the ability to offer our customers extra benefits of buying and servicing their vehicle with us and offers extra value that our competitors cannot match. When we integrate this into our daily digital strategy, it becomes a huge and highly cost-effective asset in our daily marketing efforts." To make sure his dealership was leveraging every chance to remind customers and prospects alike what they get with their unique program, Milton Toyota teamed up with David Sharma at Dealer InLine. Sharma immediately advised Gorman to incorporate these valuable benefits into all traditional and digital touchpoints for maximum effect. From voicemail to business cards, invoices, receipts to floor mats, store signage and windshield creative on both new and pre-owed vehicles, every customer touchpoint drives the Milton Toyota difference and reminds customers what's in it for them. At Milton Toyota, customers earn rewards points on every service visit. These points accumulate and lead to future vehicle discounts, as well as valuable service gift certificates based on a member's total spend. In addition, their dealership gift rewards program offers other extra benefits such as free carwashes, extra points for aftermarket and F&I purchases, free gifts from local businesses as well as so much more. "One of the extremely valuable parts of Milton Toyota's program are the special partnerships their rewards company has arranged with the fellow local businesses," says Sharma. "AutoAwards is the company Chris has worked with since 2008, and they do an amazing job. Extremely creative folks that come from the automotive industry and just get it. In addition to everything else, they have set up over 45 local business partners that offer our members exclusive daily discounts for shopping locally - a win/win for everyone involved." The integrated dealership website features a landing page where customers can go in and look at all the value they can get from this program. The landing page also allows a program member to analyze their progress, review their points, and see how close they are to their next service gift certificate. "After all, a dealer's landing page is the core of their marketing. Everything we do drives customers to this page, which features rewards videos, is linked to the Milton Toyota YouTube channel, and goes out in monthly customer facing newsletters. Timely posts about our Auto Rewards program are made on our Facebook page, and is part of our Google profile," Says Sharma. Another step was heavily playing up the FREE gifts that Milton's members get at every service visit from a local merchant, which is also added to all of the digital messaging. Since the FREE gift changes every month, it is a great focus for all digital communications. "Of course, the team behind Milton Toyota's Rewards Program is incredible. They provide all the content needed, based on the dealership's needs. They even leverage their CRM together with Milton Toyota's database, to tailor target specific emails to each rewards member. The result is that each rewards member gets personalized emails based on their status, buying habits and place in the buying cycle. Even reminds them how close they are to a service gift certificate - driving the value of their NEXT service visit, as they leave the current one." "All of the Milton Toyota staff are trained by the folks at AutoAwards to talk up the program at every opportunity. That includes everyone who interacts with customers - from our sales folks, receptionists, service advisors, BDC staff and even web chat operators. Our employees at all levels fully understand the program completely and are able to recite the benefits to every customer they talk to," says Sharma. "The creative training we receive from AutoAwards is always spot on - very engaging and since they are all car people, very relevant." "Obviously, in today's market you can't survive without a strong digital strategy," says Gorman. "Most dealerships struggle with a plan that produces results. David and his team have given us just that, an easy to follow strategy that works. When you overlay that with the powerful benefits of our rewards program - it has resulted in growth year over year." Since our founding in 1991, AutoAwards has been widely recognized as the industry-leader in automotive and marine loyalty marketing, earning longstanding relationships with many of the industry's most successful dealer groups and OEMs. Since marketing for automotive dealerships has changed in the past 25 years, AutoAwards understands the #1 predictive factor for dealer growth and profitability. Customer loyalty is the most successful way to revenue. Hundreds of automotive groups use and recommend loyalty programs for dealers as the way to drive brand loyalty. AutoAwards has always recognized the need for top notch, highly creative, effective loyalty strategies in large and small businesses alike. For this reason, our automotive loyalty marketing expertise is engineered to meet the individual needs and goals of any business - regardless of its size. Contact us online to talk about dealer loyalty or call 302-696-6000. Visit: http://www.autoawards.com/. NEWS: Take a Stroll Down Memory Lane with Wham-O ‘Super Book’ to Celebrate 70 Years of Fun!